This year I spent New Years Eve 2012 with my fellow Clandestine Cake Club host, the lovely Deepa (aka Lazy Giraffe) and our gorgeous other halves. We enjoyed a fabulous home cooked Mexican meal in their stunning chocolate box cottage with their cats and a glass of bubbly in hand, it was a perfect and civilised way to see in 2013, the best celebrations we have had in years. Not only was the company fantastic, we enjoyed A meal of slow cooked pulled pork and chipotle with goats cheese, salsa, flour wraps and guacamole to dig into for our main. It was relaxed and informal and the light bite we needed, as we could have as little or as much as we wanted post Xmas. It was delicious, perfectly spiced, as I don’t usually enjoy spicy food, but I‘ll be making this one again hehe. I managed to Vito the boozy mousse, as I really don’t like alcohol in my dessert and whipped out an old copy of Olive Magazine from 2011 to see if I could find something more delicious…well…. I couldn’t have found a more perfect dessert! 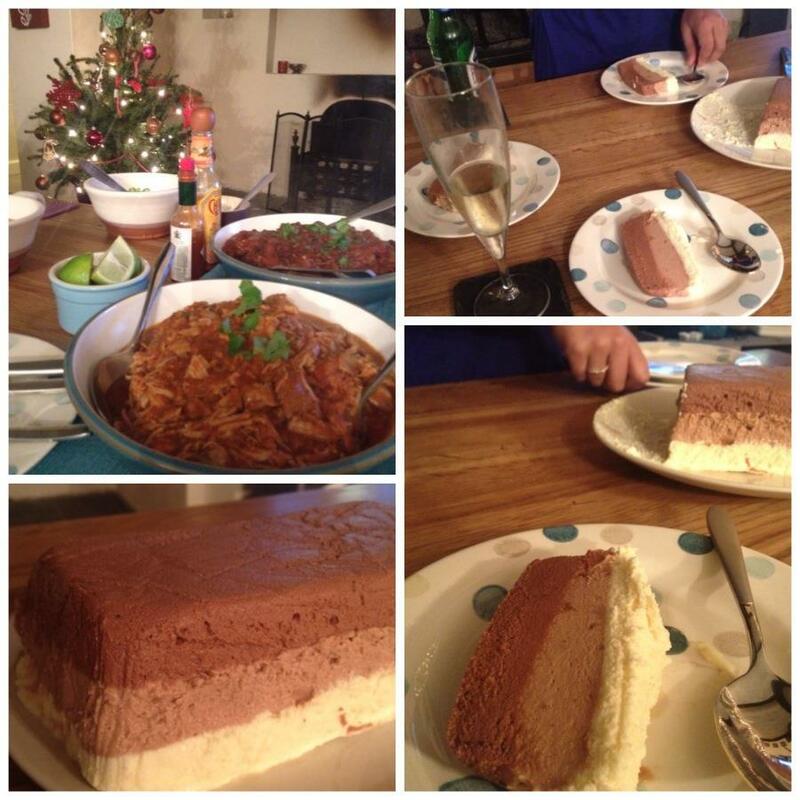 And to say this was amazing is an understatement, it was rich, chocolatey and perfect for our New Year menu. 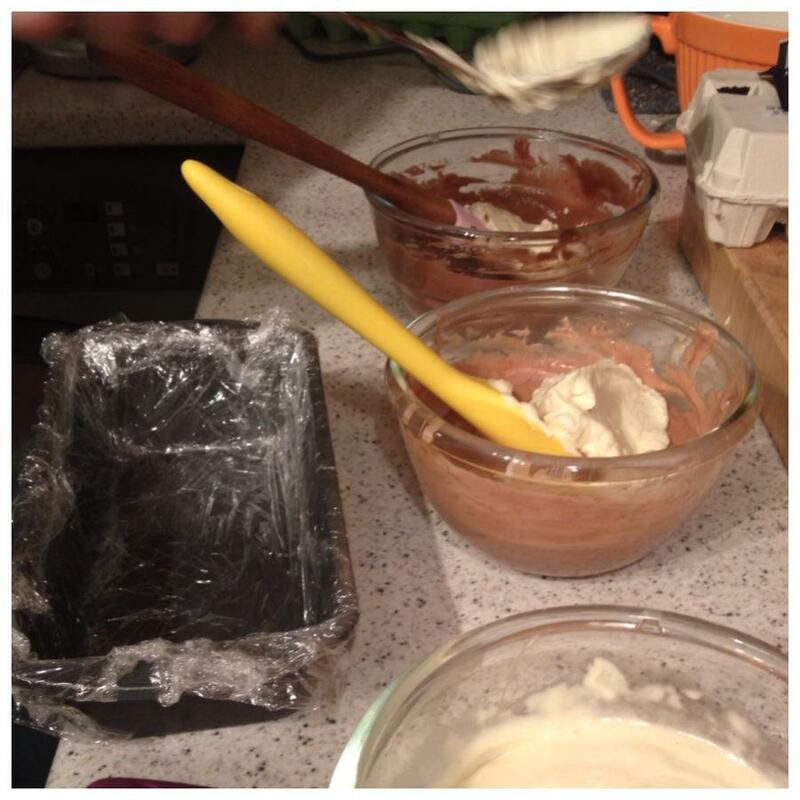 Lightly oil & then line a 900g loaf tin with a double layer of cling film, leaving overhanging edges. Put the caster sugar in a pan with 4 tbsp water and heat gently until the sugar has completely dissolved, then boil for 2 minutes. Whisk the egg whites to firm peaks in a large bowl. Once the syrup has boiled for 2 minutes, carefully pour it into the egg whites a little at a time, With the beaters still running. Whisk until it has all been mixed in. Beat for 2 minutes to cool. Softly whip the cream in another bowl and then fold into the egg whites, then divide the mix into three. Melt each type of chocolate separately and leave until cooled but still liquid. 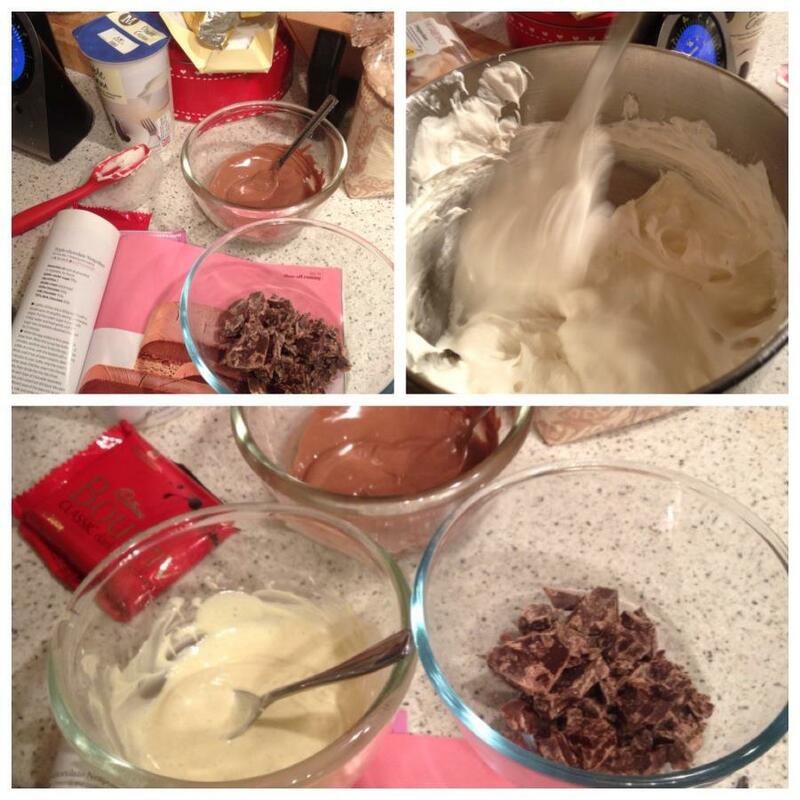 Mix each into a different bowl of the base mix so you have dark, milk and white chocolate mixes. Tip the dark mix into the lined tin, level it, then freeze for 45 minutes until just firm. Keep the other mixes chilled in the fridge until you need them. Spoon the milk chocolate mix over the dark chocolate, then level and freeze for another 45 minutes or until firm. Finish with the white chocolate layer and cover with cling film. Freeze for at least 6 hours or overnight before serving. Give it 20 minutes out of the freezer to soften a little before slicing. The only thing I did find with this recipe is that you need a good few mixing bowls to divide the mixtures into… So ensure a hot bowl of water is ready to wash up and keep up with the mess as you go along. This is stupidly easy to make, has the wow factor and the moreish appeal that your hips may not thank you for later, but who cares today? 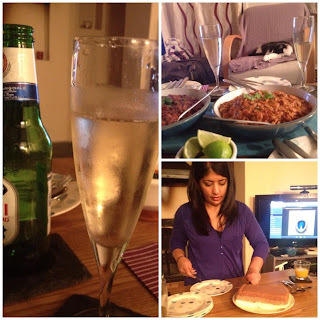 Sounds perfect and the recipe looks amazing – will remember it for the next time I want a wow! This looks so good – will definitely try it some time. 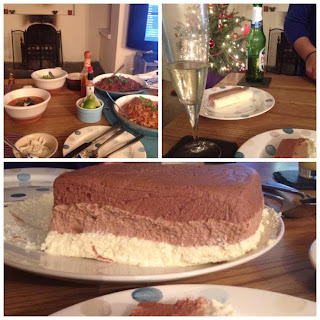 We made a Triple Chocolate Log from the new GBBO book, which I got for Christmas. It was delicious and disappeared very quickly!